4.9/5 out of 630 votes. There are many animals from around the world that are seen as lucky, that bring good luck, prosperity, wealth and any kind of good fortune. Keeping the symbols of these animals, their pictures or the animals themselves at home or around the house is extremely beneficial for the favorable energies that they bring to our lives. In Western cultures, where bats have been associated with witches since the Middle Ages, these flying mammals are generally considered bad luck, or at least no fun to have around. In many parts of Europe, people believe that ghosts take the form of bats and that the places they inhabit are haunted. But in China, bats are symbols of long life, and representations of them worn as lucky charms are guaranteed to bring happiness. If a bee flies through your window, that is a sign of good luck. It is also a sign that a stranger will come to you door. But if the bee dies in your house, that means bad luck. So watch out for that stranger. As superstitions go, the idea that black cats are unlucky is of fairly recent vintage. It dates back to the Middle Ages, when just about everybody believed in witches. They also believed a witch had the power to become a cat and that black was always the color of choice. It followed that if a black cat should cross your path, it just might be a witch in disguise and that could bring nothing but bad luck. In ancient Egypt, however, all cats were sacred to the goddess Isis. Her daughter Bast, quite powerful in her own right, was represented as a cat. And among real felines, black ones were considered closest to an incarnation of the goddess herself. Sometimes a black cat can bring good luck. They are regarded as very lucky in Japan. American folk wisdom has it that if one comes to your door, it brings good fortune to the household. Sailors have long believed that a black cat aboard ship will ensure a safe voyage, and for generations sailors’ wives have adopted black cats to help guarantee that their husbands will come home safe and sound. The ancient Etruscans put great store in talismans engraved with representations of the head of a bull. It brought long life and good health and, they believed, success in love. The Egyptians considered the bull to be an emblem of strength and dignity. The ancient Greeks regarded the bull as the earthly form of a god who insured fertility, not only on their farms, but in themselves. Representations of bull's heads in their jewelry were intended to let the god know that they honored him; by wearing the symbol, they would be rewarded with large families and productive fields. A cricket on the hearth has been a sign of household luck for thousands of years. Possible the belief stems from prehistoric times, when a cricket’s chirping provided a kind of companionship. The cricket has also served as a watchdog in China and other Asian countries for generations. At any sign of danger, the chirping will stop. Almost every Native American tribe believed in the cricket as a bringer of luck, and they regarded imitating the sound a cricket makes as disrespectful. In the Far East as well as across Europe, it is considered very bad luck to kill a cricket, even by accident. Images of crickets appear on charms and amulets, particularly those intended to ward off the evil eye, in most ancient cultures of the Middle East and Europe. One of the best known in America is the large weather vane on Boston’s Fanuel Hall, a copper cricket fashioned by our Colonials forefathers to protect the building. Among the Chinese, a talisman engraved with the head of a stag or deer will bring success in any profession where study and research are important, such as writing or the law. Cities that owe their existence to the sea, such as New York and Amsterdam, abound in carvings of dolphins, which are not just decorative, but are intended to bring luck to the port itself. The belief stems from the fact that ancient sailors who spent months or even years out of sight of land found the sight of dolphins swimming around their ships to be the first sign that land was near. As a lucky charm, a representation of a dolphin has long been believed to be especially effective in bringing good fortune to artists and musicians. Elephants are a Symbol of Wisdom, Power, Loyality, Intelligence, Strength and Solitude. They have a positive symbolic meaning all over the world and are considered a Symbol of Good Luck with it's trunk in upright position. Since the time the early Egyptians made figures of fish in gold and silver to bring luck to lovers, fish have been powerful luck producers. The Romans followed the Egyptian tradition that fish brought luck in courtship and marriage. In Japan, China, and other parts of the Far East, fish charms bring luck, wealth, and happiness. The early Christians adopted the fish as a symbol of courage and fidelity to God. Frogs represent transformation of the Positive Kind and are a Good Omen representing Happiness and great Friendships. As well as being one of the sacred emblems of Buddha, the goldfish, a member of the carp family, either in the flesh or as a good luck charm, is revered all over the Orient. It brings luck in the form of long life. The ancient Egyptians believed that having goldfish in the house was especially lucky for the whole family. The Greeks thought they brought good luck to a marriage. Probably because of their key role in advancing civilizations, horses have been regarded as lucky in nearly every civilization the world has ever known. Charms and amulets in the shape of a horse, or a horse's head, are able to help the wearer rise to new heights of achievement and happiness. In eastern Europe today, it is still believed that a face-to-face encounter with a pinto horse will make a wish come true. But those same people also believe that making eye contact with an all-white horse will bring bad luck unless they quickly spit three times over their left shoulder. 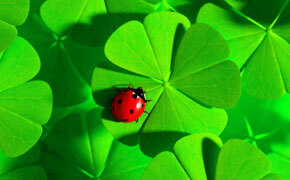 "Ladybugs, Ladybugs, fly away to your home"! Folklore suggests, if you catch a Ladybug in a home, count the number of spots and that's how many $$$ you will soon find. Good Luck! German-natives have a saying "Schwein gehabt (had Pig)" which literally means "Good Luck was at hand". Good Luck tokens in the shape of Pigs are believed to bring Good Luck, as they are a Symbol of Wealth, Good Fortune & Prosperity. Sir Winston Churchill, Prime Minister of England, once quoted: "I like pigs. Dogs look up to us. Cats look down on us. Pigs treat us as equals". Seashells have been used as sacred objects and bringers of luck for thousands of years. As one of the emblems of Buddha, shells are a powerful symbol in the Far East. Early seafarers noticed that when they placed a shell against their ear, they could hear a sound very much like pounding surf. They interpreted that as a sign that the shell was a link between those on the high seas and those left behind on land. In that way, shells became lucky charms that could ensure a safe return from a voyage. One of the most enduring tales in the history of Scotland is about King Robert Bruce, who was proclaimed an outlaw in 1306 and forced to go into hiding. When everything looked hopeless, he noticed a spider swinging back and forth, patiently spinning a web. It was the king’s lucky day. Inspired by the lesson in patience, he decided that the only way to regain his throne was to persevere as the spider had. It took him seven years to regain his crown, but after he did, his country became independent of the British, who had controlled it for three centuries. It was all thanks to a patient spider. For hundreds of generations, killing a spider has been considered unlucky. Many believe that if you walk through a spider web, you will meet a friend. A spider web in your bedroom is a sign of good luck all day long. But if you should happen to see the spider itself, especially in the morning, you may have bad luck. On the other hand, a spider is a very lucky omen if you see one in hour house in the late afternoon or evening. It is especially lucky if the spider’s head is turned toward you. The turtle is a creation of nature that carries its round shell over the ground, like heaven, and has a flat bottom, like earth. In ancient times, the shape of a turtle's shell suggested the dome of the sky and the creature became a symbol of heavenly virtue. If a pair of turtledoves nests near your house, no one in your family will be troubled by rheumatism. In medieval Europe it was believed that holding a live turtledove against a sufferer's chest could cure pneumonia.